It’s been decades since a plane or ship disappeared without warning in the legendarily mysterious Bermuda Triangle region. But, uh, why would you risk it? Specifically, if you’re arguably the greatest rapper working today, why would you agree to play the Bermuda Triangle on Halloween for a shadowy cabal of rich people? But that’s what Kendrick Lamar is doing. Don’t do it, K.Dot! 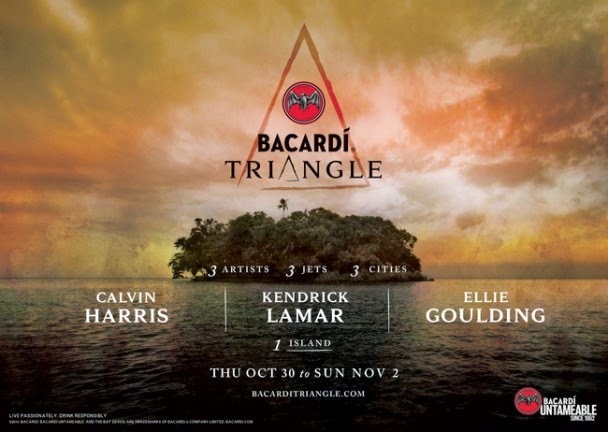 As MTV points out, Kendrick, along with dance-music money-earner Calvin Harris and future-pop ingenue Ellie Goulding, is headlining something called Bacardi Triangle, an event open only to contest winners and invited guests. The event goes down between 10/20 and 11/2, and only 1,862 guests will be able to attend. They’ll all be flown out on private jets and stay in five-star resorts in Puerto Rico. All this feels more like a setup to a supernatural TV show than a proper music festival, but if you’re feeling brave, you can find more info here.